Literary Nonfiction. Poetry History & Criticism. African American Studies. 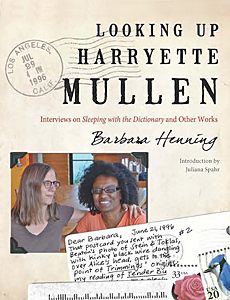 Six years after Harryette Mullen and Barbara Henning first met at the legendary Nuyorican Poets Café, Henning proposed she do a postcard-format interview of Mullen that would allow for a “very small postcard space in which to respond…[t]he idea of cards flying through the mail & overlapping.” Thus began what is now LOOKING UP HARRYETTE MULLEN, unique collaborative conversations that offer a candid look at the influences, politics, and poetics that inform Mullen’s poetry. The conversation expands even further in the second set of spoken interviews that include concerns as far-ranging as the Heaven’s Gate cult, Oulipian constraints such as S + 7 and lipograms, syllabic rhymes, and Aimé Césaire. In stunning detail, Mullen and Henning discuss the origins of each poem in Mullen’s highly acclaimed collection Sleeping with the Dictionary. For poets and readers of poetry interested in witnessing how a brilliant, singular writer embarks on the journey of generating work to scholars researching the inception of Mullen’s poems, this book informs by way of technique and vitality. 2012-05-04: Barbara Henning Interviews Harry Mathews regarding Oulipo and Looking Up Harryette Mullen.